My apologies if you’re reading this post about a hot, sunny day if its a cold and miserable Thursday afternoon and its been raining for days. This is the random post which I write on the day after the birthday party but then post on an unrelated date so birth dates cannot be deduced. These are some of the problems adoptive parents have online, its not just names and photos but key information such as dates of birth which need to remain secret. This party was for my daughter’s birthday, we celebrated her birthday with a family treat at the weekend and then we held a tea party for 6 of her friends after school. I love the planning and preparation of a party but as the years have progressed the themes have become more difficult to think of as we have done each one, Hello Kitty, Princesses, Ballet, Butterflies, Mermaids just to name a few. It was really difficult to think of an original plan this year, we’re reading Harry Potter but we were hoping to have a water party and it was difficult to link the two. After much thought, I realised that every night after we’ve read our story together, Little Miss always takes a Beano annual or comic to bed and with a few pranks and water pistols I could entwine the two ideas. I did wonder how the guests would enjoy the theme, it wasn’t a very pink party but they loved it and their party bags of tricks, a whoppee cushion, magic putty, water balloons, stretchy toys etc.. went down brilliantly. For the invitations I produced a Minnie the Minx design and then laminated them. I was using primary colours as I didn’t want a red and black theme which features prominently in some of the party ware available. I only used red and black stripy napkins and bunting and used the bright colours elsewhere. The birthday cakes ( yep plural because they were a bit smaller than I anticipated) were iced white and then I decorated them with personalised cake toppers. I continued the Beano theme with a timetable of events to let everyone know what was happening. We started with cocktails on our return from school, I did two jugs one tropical and one summer berry, the girls loved the ice, fruit and decorations. The nibbles were crisps, breadstick, crudites and dips, simple and tasty. As it was a boiling hot day the girls were really keen to cool down in the pool and I let them just splash around for half an hour, I had a basket full of water pistols, so they could all have a water fight. After all cooling down we started some water games from ideas I had from Pinterest. The first was the bucket game, the teams had to pass a cup of water over their heads down the line and place the water in a pail, the catch was there was a hole in each cup and they had to do it as quickly as possible, a fun game. Next we played water balloon bullseye, I drew three circles within each other and put a score in each circle, the girls had two balloons each and threw them to get their score. The final game was a surprise hit, I placed marbles in a bowl of water and the girls needed to remove them from the bowl using their toes, feet fishing, the focus and concentration was intense and it was highly competitive against the clock. After the games the girls played in the pool again whilst I prepared tea. I wanted to enjoy the party so kept the food very simple, an assortment of pizzas and a salad bar which they could help themselves to. We were able to sit on the grass and enjoy the food. The make your own ice cream sundae was great, my ingredients included mini meringues, marshmallows, berries, strawberry sauce and there were lots of second helpings. As well as the birthday cake I also added our family tradition of top hats, they are marshmallows, topped with melted chocolate and a smartie and have been a feature of every party menu since I was a little girl, its not a party without a top hat! After the food, we relaxed with a party playlist and the girls danced in and around the pool, impressing me with their singing and dancing, it was lovely to see and showed the rites of passage that we’ve all gone through. The party then came to an end as parents arrived for 6pm. 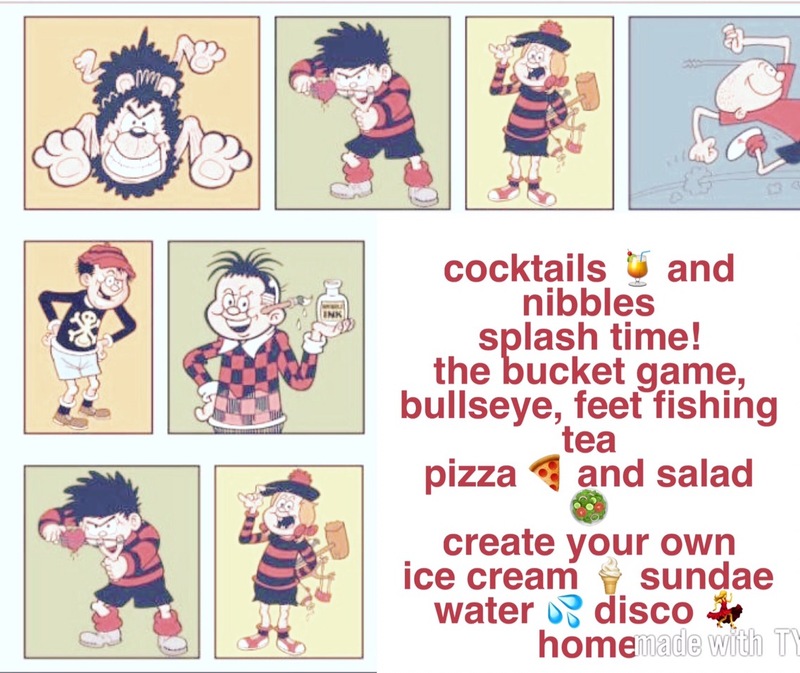 I think this has been one of my favourite parties to organise and host, the Beano theme was fun and it was a brightly decorated party. The water games were perfect on such a hot and sunny day and the mix of structured games and play worked well, the time flew by.